How To Fit A Baby Car Seat Or A Child Car Seat: Video Guides - Which? Help keep your child as safe as possible in his or her car seat with our exclusive video fitting guides. Once you’ve found a child car seat that’s suitable for your car and your child, you’ll need to fit it safely and securely in your car. 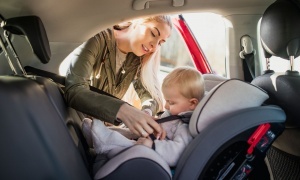 The process of fitting a child car seat isn’t always as easy as you might think, and there are several dangers to watch out for. Still looking for the best child car seat? Find out which scored top in our child car seats reviews. Choosing the right child car seat and fitting it correctly go hand in hand – your child won't be protected if either is wrong. 42%Parents who bought a new car seat didn’t have the fit checked at all. To make sure you know how to fit your child car seat correctly, we've created five handy video guides that walk you through fitting your child's very first child car seat, a Group 1 toddler seat and fitting a high-backed booster for older children. So you've got an easy step-by-step guide you can come back and watch at any time. We must stress that you should always get your child car seat fitted for the first time by an expert. But watch the relevant video before you go for your fitting to make sure the retailer you've chosen knows what they're doing. You can also use the videos to refer to for those times in the future when you might need to take the car seat in and out of the car yourself. Simply click on the video you want to play below. Even a Which? Best Buy child car seat can't protect your little one properly in a crash if it's not fitted correctly in your car. 5) Keep the instructions with the seat for future reference. If you lose the instructions, download another copy and keep them safe with the seat in case someone else needs to move your car seat between cars. Browse all the best child car seats. Only logged-in Which? members can view our reviews. If you’re not yet a member, you can get instant access by joining Which?. If you have a relatively new car, it's likely to have Isofix mounting points. This is the standard system for all new cars and seat manufacturers, designed to make installing your child safety seat quick and easy. Since 2002 most cars now have Isofix connectors as standard. Many parents worry about fitting their car seat correctly using the car's seat belt, but with Isofix you simply ‘plug in’ a compatible car safety seat to mounting points in the car – rather than fiddling with seat belts. Isofix car seats are considered safer as they are easier to install, and as the seat is fixed to your car, they can hold the car seat more securely than using the car's seat belt. An Isofix car seat has three anchor points which allow it to be attached to your car. The three points are made up of the two Isofix connectors on either side of car seat (or base, if you're using one) and a third anchor point. This will either be a support leg, that sits on the floor of the car, or a top tether, that attaches to a mount behind the rear seat. This third anchor point, via either method, prevent a car seat from tipping forward in an accident. Since late 2012, most new cars will have a top tether point. Your choice of car seat will be determined by the car that you have. 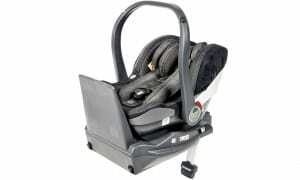 Car seats that use a support leg can't usually be used in cars that have underfloor storage compartments in the back, so a top tether can be used instead. 1) The safest place for your child is in the back of the car, so do always try to fit your car seat in the back. The back middle seat is generally the safest and can be used if the seat has a three-point seat belt. 3) Forward-facing seats can sometimes be installed in the front passenger seat. Check your car's manual as some manufacturers advise against this. The safest place for your child is in the back of the car but, if you want to put them in the front, make sure the passenger seat is pushed as far back away from the dashboard as possible and fit the child car seat securely. 4) Check your car's head rest won't interfere with getting a snug fit for your car seat. If the head rest is getting in the way, either pull it up out the way or remote it all together. 5) Never modify you child car seat in any way that could affect how it fits into your car, as this could mean it won't protect as it should do in an accident. Download and print off our 10 child car seat fitting checks to help you get the best out of your purchase.